This cool little mushroom is widely distributed, and is frequently found in late summer and fall. Like its close cousins, Collybia cookei and Collybia cirrhata, Collybia tuberosa grows from the decaying remains of other mushrooms--often, species of Lactarius or Russula. 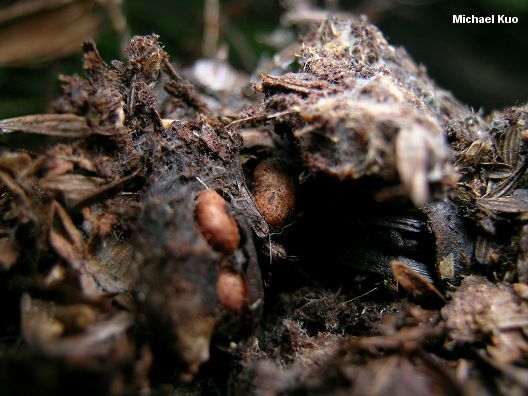 Sometimes, however, the host mushroom is so far decayed that it is recognizable as a former mushroom only to true myco-geeks who have spent many hours of their lives prying into smelly, blackened fungal remains. Unfortunately for normal people, a thorough investigation of the mushroom's substrate is necessary to distinguish it from its relatives. Collybia tuberosa grows from little knots of tissue, called "sclerotia" in Mycologese. You will need to pry around with your fingers or a stick to find the sclerotia. If they are absent, you may have found Collybia cirrhata. If sclerotia are present, you have found Collybia tuberosa if they are more or less elliptical and reddish brown (see illustration). Collybia cookei has rounder, yellowish sclerotia. 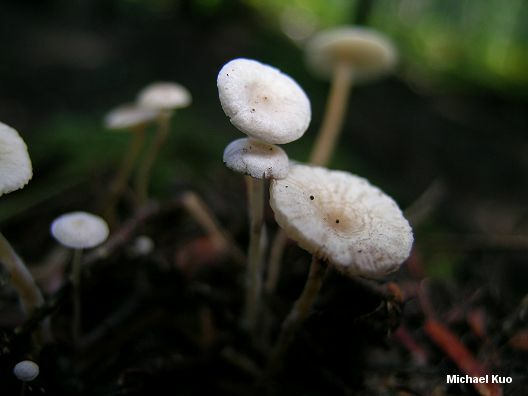 Ecology: Saprobic; growing gregariously on the remains of decayed mushrooms (especially Lactarius and Russula species), or occasionally on humus; found under hardwoods or conifers; summer and fall (or in winter in warm climates); widely distributed in North America. Cap: 2-10 mm, convex with a somewhat inrolled margin when young, becoming broadly convex to flat, with a central depression; dry or moist; more or less bald; sometimes lined on the margin; whitish. Gills: Attached to the stem; close or almost distant; whitish or pale pinkish. Stem: 1-5 cm long; about 1 mm thick; more or less equal; dry; often minutely dusted at the apex and/or base; whitish to pinkish; becoming hollow; attached to sclerotia which are tear-shaped or elliptical, reddish brown, and measure 3-12 x 2-5 mm. 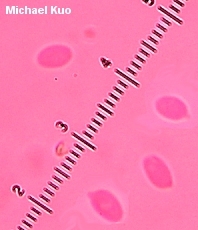 Microscopic Features: Spores 4-6 x 3-3.5 µ; smooth; ellipsoid to sublacrymoid; inamyloid. Pleurocystidia absent. Cheilocystidia present but scattered, rare, and inconspicuous; 18-32 µ long; cylindric, with occasional lobes or projections. Pileipellis a cutis or ixocutis of hyphae 2-5 µ wide; pileocystidia absent. REFERENCES: (Bulliard, 1780) Kummer, 1857 (Fries, 1821; Saccardo, 1887; Kauffman, 1918; Lennox, 1979; Smith, Smith & Weber, 1979; Halling, 1983; Arora, 1986; Phillips, 1991/2005; Lincoff, 1992; Barron, 1999; Halling, 2003; McNeil, 2006; Kuo & Methven, 2010.) Herb. Kuo 09130402.